The University of Central Florida has received a silver rating for its sustainability by a program within the Association for the Advancement of Sustainability in Higher Education, a Philadelphia-based organization that works to empower people to be change agents of sustainability innovation. 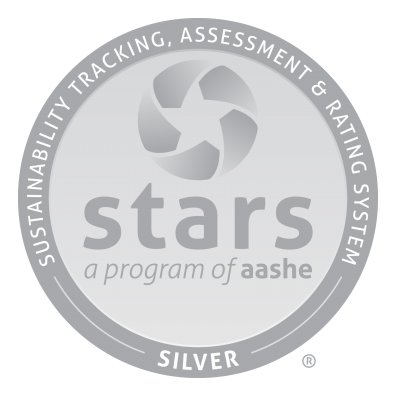 Sustainability Tracking, Assessment & Rating System, known as STARS, is the program behind UCF’s ranking. It’s a tool used internationally by more than 400 colleges and universities to voluntarily make their sustainability performance transparent, all while using its data of other institutions as a benchmark and guide on ways to improve. UCF’s ranking is credited to numerous categories including its energy-efficient buildings, how campus is used as a living laboratory and its commitment to diversity, said Yara Watson Colon, coordinator of sustainability initiatives, who spearheaded UCF’s participation in STARS. For instance, UCF has 22 Leadership in Energy and Environmental Design-certified buildings, with more coming in the future such as UCF Downtown and Trevor Colbourn Hall. Among those LEED-certified buildings are the Recreation and Wellness Center, Classroom Building II, and Career Services and Experiential Learning. Features such as individual lighting controls in each room to reduce power usage, reflective roofs to minimize heat retention, and accessibility by public transportation and biking have led these buildings to LEED Gold certification. Part of UCF’s success in LEED certifications is from a university policy adopted in 2008 that requires all new buildings and renovations to older buildings meet LEED criteria. That has led to energy-efficient lighting, heating, ventilation and air conditioning equipment in new buildings of the main campus, Watson Colon said. “Since 2004-05, our gross floor area of building space on campus has doubled in size and in that same time frame we’ve reduced total building-energy consumption by more than 40 percent,” Watson Colon said. Campus also is used as a living laboratory to help students learn and faculty conduct research. For instance, a student project has led to a floating solar farm in a campus retention pond that provides power to the university’s grid. The panels also have become tools for students, faculty and staff to better understand solar power without having to leave campus grounds. Plus, the first phase of an Open Energy Information System made by UCF Utilities & Energy Services went live last semester and shows university data including energy consumption, water usage by buildings and more. Information is still being added to the system. “It’s a practical learning tool for students to see how utility usage impacts a building’s sustainability,” said Muthusamy Swami, Florida Solar Energy Center program director who used the Open Energy Information System in his HVAC Systems Engineering class at UCF. “Students can see how newer technology impacts building systems, and compare and contrast newer buildings to older ones. I noticed they were more enthusiastic when studying buildings they see all the time. This tool is helping them be better prepared for industry,” Swami said. University-wide sustainability also has come from UCF’s commitment to diversity and inclusion. At UCF, diversity and inclusion programs support minority faculty, staff and students. Programs include the black, Latino and pride faculty and staff associations, and the Legacy Leadership and Mentoring Program that pairs minority students with faculty, staff and professional-development resources to help guide them toward graduation. These diversity initiatives and others support one of UCF’s five key goals – to become more inclusive and diverse – established by President John C. Hitt in 1992. This is the first time UCF has used STARS to rate its sustainability. Looking ahead, Watson Colon predicts the university can achieve a platinum rating within a decade. For instance, UCF is an emerging Hispanic Serving Institution, meaning close to 25 percent of enrollment is by Hispanic students. The university is expected to earn the Hispanic Serving Institution designation in the near future by the U.S. Department of Education. Also, steps are being taken to reduce UCF’s potable water usage by 50 percent. Reclaimed water – treated wastewater – is being tested in two chilled water plants that help heat and cool campus buildings and may lead to all university water plants being converted to reclaimed water from potable water. Potable water is drinkable and requires greater treatment, energy usage and cost. By reducing potable water usage, UCF would lessen its demand on the aquifer that faces overstress due to water being extracted quicker than it can be naturally replenished.